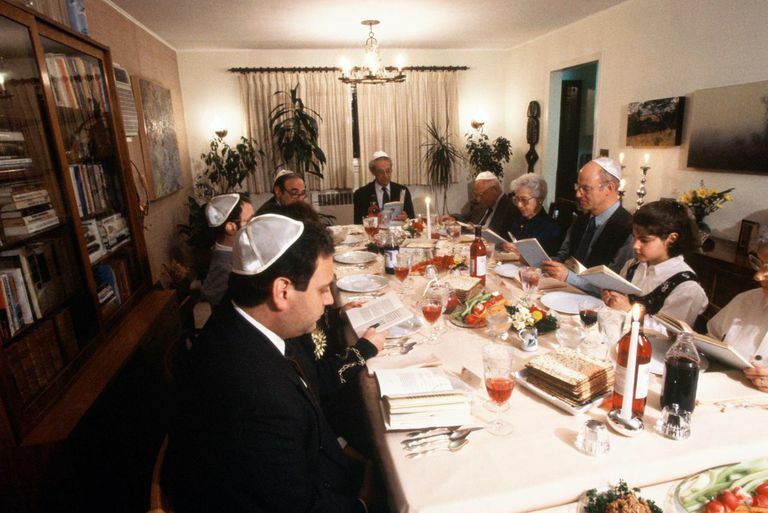 A Passover seder is a service held at home as part of the Passover celebration. It is always observed on the first night of Passover and in many homes, it is observed on the second night as well. Participants use a book called a haggadah to lead the service, which consists of storytelling, a seder meal, and concluding prayers and songs. The word haggadah ( הַגָּדָה) comes from a Hebrew word meaning "tale" or "parable." The haggadah contains an outline or choreography for the seder. The word seder (סֵדֶר) means "order" in Hebrew; indeed, there is a very specific order to the seder service and meal. There are fifteen intricate steps to the Passover seder. These steps are observed to the letter in some homes, while other homes may choose to observe only some of them and focus instead on the Passover seder meal. Many Jewish families observe these steps according to long-running family tradition. Water is poured over the hands to symbolize ritual purification. Traditionally a special hand washing cup is used to pour water over the right hand first, then the left. On any other day of the year, Jews say a blessing called netilat yadayim during the handwashing ritual, but on Passover, no blessing is said, prompting the children to ask, "Why is this night different than all other nights?" A blessing over vegetables is recited, and then a vegetable such as lettuce, cucumber, radish, parsley or a boiled potato is dipped in salt water and eaten. The salt water represents the tears of the Israelites that were shed during their years of enslavement in Egypt. There is always a plate of three matzot (plural of matzah) stacked on the table — often on a special matzah tray — during a seder meal, in addition to extra matzah for the guests to eat during the meal. At this point, the seder leader takes the middle matzah and breaks it in half. The smaller piece is then put back between the remaining two matzot. The larger half becomes the afikomen, which is placed in an afikomen bag or wrapped in a napkin and is hidden somewhere in the house for the children to find at the end of the seder meal. Alternatively, some homes place the afikomen near the seder leader and the children must try to "steal" it without the leader noticing. During this part of the seder, the seder plate is moved aside, the second cup of wine is poured, and participants retell the Exodus story. The youngest person (usually a child) at the table begins by asking the Four Questions. Each question is a variation of: "Why is this night different from all other nights?" Participants will often answer these questions by taking turns reading from the haggadah. Next, the four types of children are described: the wise child, the wicked child, the simple child and the child who doesn't know how to ask a question. Thinking about each kind of person is an opportunity for self-reflection and discussion. As each of the 10 plagues that struck Egypt is read aloud, participants dip a finger (usually the pinky) into their wine and put a drop of liquid onto their plates. At this point, the various symbols on the seder plate are discussed, and then everyone drinks their wine while reclining. Participants wash their hands again, this time saying the appropriate netilat yadayim blessing. After saying the blessing, it is customary not to speak until the recitation of the ha'motzi blessing over the matzah. While holding the three matzot, the leader recites the ha'motzi blessing for bread. The leader then places the bottom matzah back on the table or matzah tray and, while holding the top whole matzah and the broken middle matzah, recites the blessing mentioning the mitzvah (commandment) to eat matzah. The leader breaks pieces from each of these two pieces of matzah and provides for everyone at the table to eat. Because the Israelites were slaves in Egypt, Jews eat bitter herbs as a reminder of the harshness of servitude. Horseradish, either the root or a prepared paste, is most often used, although many have taken on the custom of using the bitter parts of romaine lettuce dipped into charoset, a paste made of apples and nuts. Customs vary from community to community. The latter is shaken off before the recitation of the commandment to eat bitter herbs. Next, participants make and eat the "Hillel Sandwich" by putting maror and charoset between two pieces of matzah broken off of the last whole matzah, the bottom matzah. At last, it's time for the meal to begin! The Passover seder meal usually begins with a hard-boiled egg dipped in salt water. Then, the rest of the meal features matzah ball soup, brisket, and even matzah lasagna in some communities. Dessert often includes ice cream, cheesecake, or flourless chocolate cakes. After dessert, participants eat the afikomen. Remember that the afikomen was either hidden or stolen at the beginning of the seder meal, so it has to be returned to the seder leader at this point. In some homes, the children actually negotiate with the seder leader for treats or toys before giving the afikomen back. After eating the afikomen, which is considered the seder meal's "dessert," no other food or drink is consumed, except for the last two cups of wine. The third cup of wine is poured for everyone, the blessing is recited, and then participants drink their glass while reclining. Then, an additional cup of wine is poured for Elijah in a special cup called Elijah's Cup, and a door is opened so that the prophet can enter the home. For some families, a special Miriam's Cup is also poured at this point. The door is closed and everyone sings songs of praise to God before drinking the fourth and final cup of wine while reclining. The seder is now officially over, but most homes recite one final blessing: L'shanah haba'ah b'Yerushalayim! This means, "Next year in Jerusalem!" and expresses the hope that next year, all Jews will celebrate Passover in Israel. What Is the Afikomen in Passover Tradition? What Is Charoset at a Passover Seder?